At first look, Boetticher’s 1948 film Behind Locked Doors solidly belongs to the tradition of the “asylum” B-movie sub-genre that only two years earlier delivered the RKO classic Bedlam (Mark Robson, 1946), and culminated in 1963 with maverick auteur Sam Fuller’s gritty Shock Corridor. It is easy to see why the asylum setting fascinated filmmakers. Offering a simple – and most of all safe – metaphor for the madness of the outside world, mental institutions (and the microcosm they contained) provided a pretext for all sorts of disturbing images and situations, and as such became the subject of a number of horror films in the 1930s and 1940s. In this context, of course, the reality of mental institutions was not overly significant. The asylum was turned into a land of nightmares, a place where Freud, Jung and Edgar Allan Poe met for the purposes of frightening audiences. It was only much later, with the growing social awareness of the plight of the mentally ill, that filmmakers would turn their attention to the asylum inmates themselves, capitalising on the inroads made by researchers to provide new insights into their conditions and to expose the abuses within the system. Behind Locked Doors falls neatly into the earlier category, and as such it provides no insights or exposés, presenting instead an improbable story that anticipates many of the situations later found in Shock Corridor. A private detective teams up with an attractive reporter to track down a corrupt judge, who has been hiding in an asylum to avoid the police. In order to find him, the private eye poses as a manic-depressive and is admitted to the asylum as a patient, where his snooping almost costs him his life when the judge and his cronies discover his true identity. Not surprisingly, the private eye and reporter bicker at any available opportunity throughout the story, and inevitably fall in love. As it may be clear from this summary, the film pays little attention to the mental patients themselves, who are of interest to the filmmakers only as far as their individual illnesses can help the furthering of the far-fetched plot. The mechanistic nature of their behavior is exemplified by the way in which the resident “firebug” is used by the protagonist to create a distraction that will allow him to sneak into the off-limits section of the asylum. Simply by handing the man a matchbook, he knows in advance that the inmate will inevitably and immediately start a fire, as though arson were a full-time activity only prevented by the lack of an on-hand combustible substance. Similarly, “The Champ” – a brutal, simian-like thug locked in isolation – will punch anything and anyone that enters his cell, and thus becomes the unlikely murder weapon chosen by the film’s villainous trio to dispatch the protagonist. Still, despite all its shortcomings, Behind Locked Doors manages to remain a captivating endeavour at it strays from the film canon and leaves conventions behind to engage in a fascinating game of genre-switching instead. Starting as a conventional noir, the film progressively turns into a monster-less horror movie, all the while allowing for shifts into a sort of romantic comedy whenever the two leads are alone together. 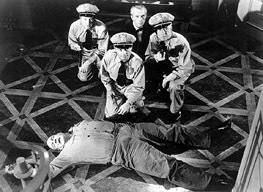 Most notable about this deliberate hopscotching is the way Boetticher maintains a substantial degree of tonal consistency within each stage of the film, aided particularly by the appropriate camerawork. Using shifting ranges of contrast and camera angles to match the shifts in tone, cinematographer Guy Roe – who went on to shoot the additional footage, featuring Raymond Burr, that was added to the infamous American release of the original Godzilla (1954) – establishes the narrative framework or style that each genre calls for, from the brighter, closer shots that define the rambunctious bickering of the two leads as their romantic involvement progresses, to the darker, starker lighting, and the apt choice of lower, more menacing angles, for the scenes where the villains’ murderous plans unravel. If the cinematography is essential to the success of the film, the sets, on the other hand, expose its low-budget. Still, the flimsiest of them all, the upstairs “Locked Ward”, manages at least to transport the viewer into Ed Wood-land, both for its overall chintzy look, and for the presence of Wood’s grotesque favourite, Tor Johnson, in the uncredited role of “The Champ”. While story and dialogue are paper-thin, the cast members, most of them Hollywood veterans, deliver effective performances that add texture and vitality to the whole production. Particularly notable is Richard Carlson as the protagonist, Ross Stewart. While never rising above the B-movie standard that defined his subsequent career – including classics like Creature From The Black Lagoon (Jack Arnold, 1954), It Came From Outer Space (Jack Arnold, 1953) and The Valley Of Gwangi (James O’Connolly, 1969) – he is quite effective at adapting his performance to the tonal shifts of the film, ultimately delivering a suitable lead character for each of the genres the film navigates.